Where can you find shots of espresso, local burgers for $4.95, and volumes by Ayn Rand, Richard Wright and John Irving to flip through as you’re eating? 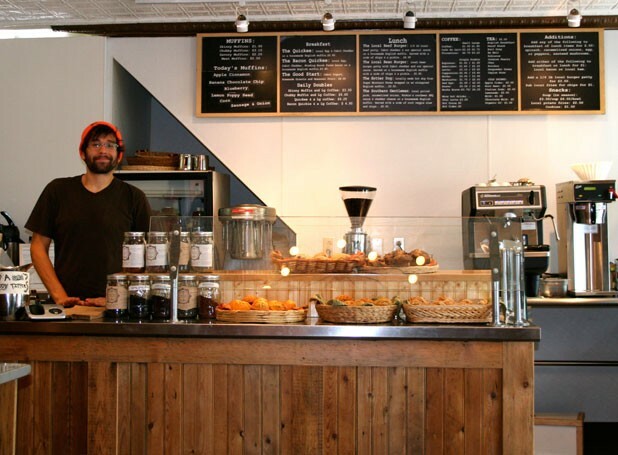 At the Chubby Muffin — the newest project from the team behind the Skinny Pancake. Located on Oak Street in the Old North End, near the Boys & Girls Club of Burlington, the spot started serving its namesake pastries in flavors such as corn, banana-chocolate chip and savory sausage and onion — with prices from $1.95 to $3.15 — last Saturday, along with a small menu of snack-shack-style favorites. Like its sister crêperies, the Muffin boasts compostable takeout containers and plenty of Vermont-grown goodies. “We have 500 pounds of blueberries in our freezer,” says co-owner Benjy Adler, interviewed while preparing to teach a class on jam making in honor of Eat Local Week. The frozen fruit can go into localvore pastries all year round. Next summer, Adler says, he hopes to dish out cones of homemade soft-serve ice cream. 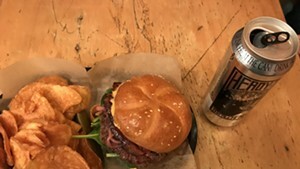 Local meat has a pricey rep, but Adler and company are offering burgers for less than 5 bucks and pulled-pork sandwiches for $5.95. “What’s surprising is that local ground beef is not much more expensive than commodity ground beef,” Adler explains. “If we do a high enough volume, it should work just fine.” A Vermont-made bean burger could keep vegetarians coming back, too. With a handful of tables made of reclaimed wood, a freshly painted tin ceiling and a neatly lettered chalkboard menu, the Muffin feels cozy and inviting. The only problem may be parking: The café has just one dedicated spot. When it’s taken, patrons must navigate nearby residential streets at the whims of the traffic gods.